Another classic vehicle seen in Australia during 2005. Austin Books Whether for the Sheerline ambulance as shown below, or any other type of Austin, it is worth having a look on Amazon for books, DVDs, Videos etc. 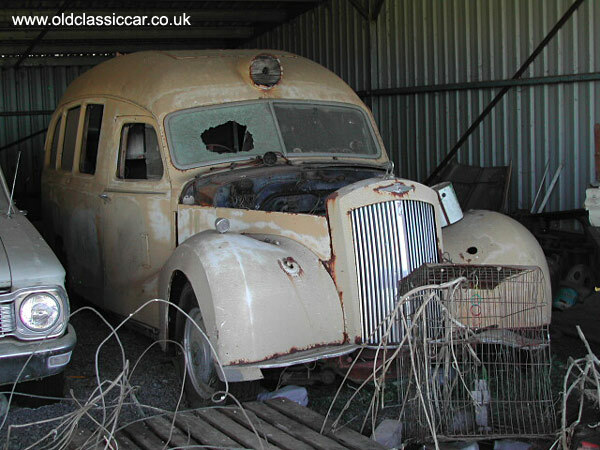 Have you seen today's eBay auction listings for the Austin Sheerline ambulance? How could I resist featuring this lovely old ambulance here - just look at the wonderfully swoopy rear coachwork on this example - the rare and sought-after Lucas P100 headlamps are long gone it seems!! If you have any more details to share about this Austin seen in Australia and featured here, please get in touch. This photo of an old Sheerline ambulance is one of 81 photos I have in this section, all of classic or vintage vehicles that were spotted across Australia in 2005. You'll find all the other pics in this section on the main Australian Classics page, containing pictures of both restored and unrestored classics that live over there.